Weekends during summer, especially if you’re at the beach or the “Rivah” (Richmondese for “at my river house”) can get way too hot and muggy to want to cook in the kitchen. But if you’re in the mood for an easy and elegant lunch, what are you to do?You can prepare this deliciously refreshing salad without hovering over the stove if you buy pre-cooked shrimp. Or you could fire up the grill and boil the shrimp and pasta outside without heating up the kitchen. Remember, the grill is just an outdoor gas, wood or charcoal-fired oven. If you’re not grilling up all-American burgers and hotdogs today, you might want to give this a shot. Feel free to toss in any vegetables that you like. Broccoli works really well, as do peppers, especially red ones. And the bowtie pasta is just pretty, but subsititute away. In the image above (I forgot to take a picture of the real thing before diving in…) the shrimp is accompanied by crabmeat and a penne style pasta. As with most things, the dish goes really well when served with a cold Rosé cava like Cristalino. 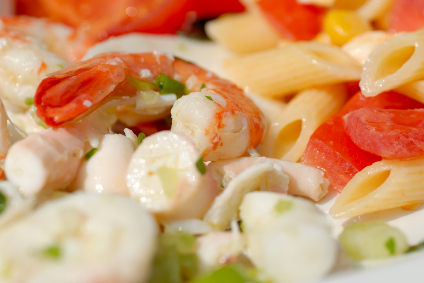 Cold Shrimp Salad with Bowtie Pasta for 4. 1/2 box of bowtie pasta, cooked al dente and cooled in an ice water bath. 1/2 lb of large, fresh shrimp, cooked in shell and then peeled and deveined. Mix all ingredients together in a large bowl. This dish can be prepared a day ahead and kept cold in the refrigerator. But it’s hard to resist the urge to sneak a spoonful or two. This entry was posted in Entertaining, Living and tagged dining, Entertaining, Living, lunch, recipes. Bookmark the permalink.